It is that time of the year where the villains would rule our world. Talented artists can choose up to three evildoers as their subject in their exhibit. Come dressed as in your favorite black get up as glow thingies will be available at the venue itself. The address of Vara Diner and Cafe is 103 Park Ave. Vermont Park Village, Mayamot, Antipolo City. 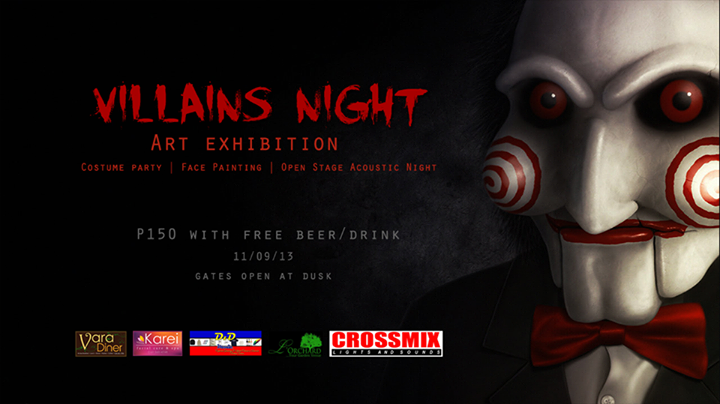 Be prepared for a grand Halloween party on November 9, 2013. Gates open 6 PM and entrance fee will be P150 inclusive of one drink on the menu. I was delighted to join another Openrice Eat's a Date and this one was held at Hap Chan Seafood Restaurant at Harbor Square. Since I am Chinese, I have actually tasted most of what they served in the past. Hakaw is my favorite dimsum dish of all time. One serving is just not enough for me as the steamed shrimp dumpling makes me giddy for more. A lot of people are very fond of siomai and it has inspired food carts dedicated to it. It really is a great snack and Hap Chan has a very nice version. The combination of minced pork with lettuce is so good that it really lit up my eyes. Who does not like Chicken Feet? This dish pleases everyone. Whenever me and my family would dine at Hap Chan, I would always order Lemon Chicken. It is a classic Chinese dish with good reason. One good thing about their beef steak is that it is so tender. It really goes well with the sweet sauce and onions. This is one dish I would eat so fast because it is so tasty. It is a good thing Hap Chan's fried spareribs with salt and pepper don't have much bones in it. It is crunchy and that is always a good thing. The salt and pepper squid really tastes well when dipped into the vinegar sauce. I don't like squid that much but I would make an exception for this dish. Their version of kikiam sure nailed the spot. Overall, I enjoyed my lunch at Hap Chan and I am sure the other bloggers did as well. Philip-Lifestyle Guy is a new Sunday show on TV5 starting on October 27 11 AM up to 12 noon. Philip is very popular in the PR world as his clients included the likes of Studio 23, MTV, Dockers, Ericsson and Bacardi. Philip along with Paolo Abrera launched the free magazine called Zero which would become FLY six years later. It became so popular that it was also distributed in Hong Kong. The lifestyle show is going to be about everything from good food to awesome spa treatments. It also gives the audience a chance to experience what they are experiencing in the show. He wants everyone to enjoy the good lifestyle, not just those who can afford it. The show is directed by Dave Hukom and written by Yasmine Holes. 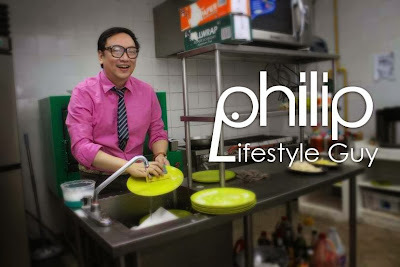 It consists of segments such as Phil-up! where anybody would try the featured products, I Saw the Sign, Whatchathink? where random people are asked about tough trivia questions and Philip's Finds where they feature the hippest places to chill and unwind around the Metro. The night would not have been complete without some delicious food by Rub Restaurant. The pizzadilla really made my heart melt. It was one good snack. Their specialty bbq back ribs are worth coming back for. It is one of the best baby back ribs I have ever tasted and it is a good thing I got to go to this restaurant because I got to taste it. I really love bbq back ribs. Life does not get any better than the Teng brothers as they have to deal with basketball, screaming women and a bunch of endorsements. That is not even including appearances on being interviewed by the likes of Vice Ganda, Ryza Mae and Karen Davila. We sat down with the Teng brothers and they were more than happy to answer all of our questions. For my question, I asked Jeron how it feels to have Kobe Paras as a teammate. He answered by telling us that he would welcome that because he is a high flyer. In one of the funniest things I have ever seen, one of my colleagues that night actually asked them who they think is more handsome out of the two. Jeric quickly said that he thinks it is him while Jeron returned the question to the interviewer. It was one hilarious moment I would not forget soon. The brothers reflected on their heated exchange in Game 1 of the finals and how it will probably never again due to the fact that they are back to being brothers unless they are on opposing teams in the PBA. Jeric told us that it would not really matter which PBA team selects him because it would be an honor itself to play in the PBA. When asked if they were not playing basketball, both of them were unanimous in saying that they want to open a restaurant. Jeron also admitted that he eats more out of the both of them. It is none other than the Thai Food Queen Chef Cecille Chang. She is most known for being the creator of Thai at Silk, Simply Thai, Thaipan and Thai Bistro. She welcome me and the rest of my CLIQUE to her newest creation, Silk Road. Her excellent Thai food are once again on display and it is in a relaxing and cozy setting right in the middle of the busy streets of Bonifacio Global City. I admit some of the dishes we got to taste here were carry overs from Thai Bistro at Robinson's Magnolia but I was not complaining because they were really good. She tells us that she named it Silk Road because of how awesome 4th avenue is shaping up to be with the soon to rise Shangrila Hotel next year. Mieng Kham is one of the most popular appetizers in Thailand. At first, I thought you were not going to eat the leaves but you are actually going to eat the entire thing. It is loaded with shrimp and some spices. Thai Ravioli is steamed beef and shrimp gently wrapped in rice pepper. It tasted so good that I kept on getting more until there was nothing left. These eggs are presented perfectly along with a chili on top of it. You won't believe that it is just eggs as it is named like that because it was made by mothers for their future son in laws. Chicken Basil is fried egg, string beans and minced chicken. It was an interesting combination to say the least but it really worked. It was something that got my appetite going for the rest of the dishes. I have to confess a lot of Pad Thais were served to us by the time everyone else was full. It was so good that I had to take it home so I could eat it the next day. It is best mixed with any type of meat indeed. The Lamb Shank Massaman was actually slow cooked for about 8 hours. It is amazing how something that is cooked for that long can be eaten in just 5 minutes since the meat was tender and good. 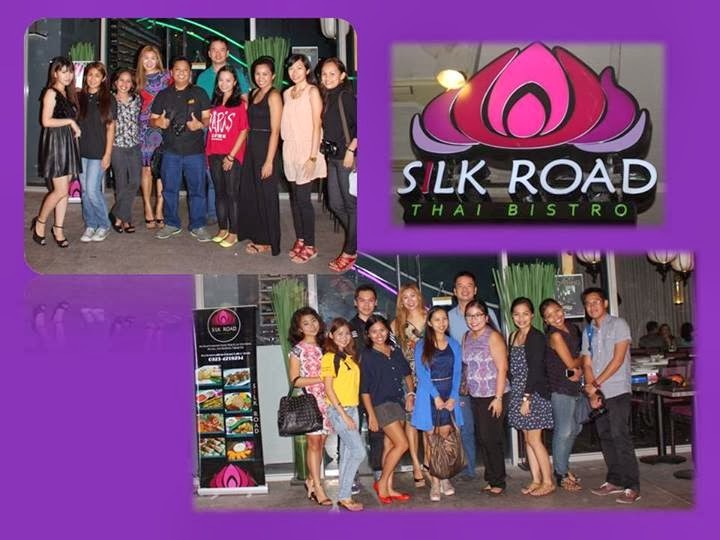 Silk Road also has a function room upstairs for private gatherings. Chef Cecille also revealed to us that she plans on making this a sort of party place after 10 PM. She is also planning on opening a culinary school for her to share her knowledge about Thai cooking. It is going to be even more exciting on December as they will be having an eat all you can buffet plus unlimited wine at a fixed price. It was real cute how the Thai Spring Rolls were presented as they were like riding on a viking boat on their way to somebody's big mouth. That is exactly what happened on this day as they made their way to my stomach. When the Siamese Pork Ribs came out, I really could not believe my eyes because of the glorious presentation. It was the first time I saw caramel pork ribs over charcoal. It tasted as good as it looks. This was one of those dishes that I won't forget in our Thai Bistro dinner. The coconut ice cream was put on top of a nest made out of sweet potatoes to go along with chocolate sauce. It is indeed something to crave for. The dessert sampler combined their specialties into one. It combined the sticky rice with mango, takhoo thai and strawberry sago. It was indeed the perfect ending to a very hearty meal. I was more than happy to attend the Good Food Press lunch a few days ago being a blogger advocate. It was a big celebration as it is World Food Day as 2013 is National Year of the Rice. It was a night where all the celebrity and chef advocates presented their brown rice recipes at the PETA Theater Center. When I first heard about the Brown Rice campaign, I told myself it was something I wanted to be a part of. The mission of the campaign is to encourage everyone to make the healthy shift from white rice to brown rice. I think it is exciting how this campaign has reached new levels and it won't be a matter of time before every restaurant starts serving brown rice as an alternative to white rice just like brown sugar is an alternative to white sugar. Mikael Daez is one advocate who did not last too long in the event as he had other commitments. I really felt sorry for him because he missed out on the delicious food that was catered by Edgy Veggy. Chef Tatung is known for knowing the benefits of brown rice and making a lot of good food out of it. Singer/Songwriter/Yogi Fair founder Nitya Saulo delighted the crowd through her entertaining personality. Catch the Yogi Fair (a fair full of arts, crafts, music and awesome food) twice a month at My Little Art Place. I have to hand it over to the celebrity chefs and Edgy Veggy because that was the best lunch I had this month. The best part about it is I ate guilt free food. Chef Kenny let us taste some of his brown rice ice cream and it is something I would really crave up until know. Singer/songwriter Aia de Leon gave us a sample of her beautiful voice. She definitely has a lot of talents up her sleeve. Tuesday Vargas is one good entertainer. When we wanted to have a picture with her, she said it would be 10 pesos per picture. She is also an event stylist and she is responsible for the beautiful flowers on each table at the venue. I have to applaud the two hosts for the night especially Roxanne Barcelo. They knew what they were saying and never bored the audience. They were the key in making the event as successful as it was. Singer Bayang Barrios has one of the beautiful voices in the country. She prefers brown rice because she knows it is going to be the key in solving the hunger problem in her hometown Mindanao. At the end of the night, it was one of those events I was proud to be a part of. It was certainly one of the highlights of this year and I would love the be a part of the future events of the Brown Rice campaign. Singer Noel Cabangon is also the Vice President of Dakila. The day also launched the Good Food planner. It is a very nice planner that contains pictures from the events previously held at Sev's Cafe and Edgy Veggy. It also contains profiles of the celebrity advocates and their recipes as well as little known facts about brown rice. It also provides information about the top vegetarian restaurants in the country.